Er, does this mean I don't have to tip the driver? 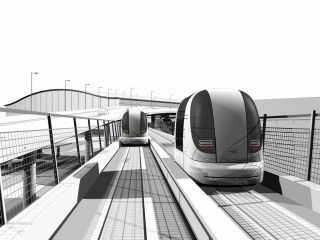 New driverless pods, due to be installed at Heathrow airport in 2010, are to be showcased at London's Science Museum. The space-age looking Personal Rapid Transit Systems (to give them their proper name) can carry up to four adults and are endowed with enough space to hold your entire luggage. The cabs are even air-conditioned so you won't get too hot under the collar before you enter Terminal Five. These pods are definitely for short haul, with them initially pencilled in to do a four minute journey – ferrying passengers between Terminal Five and Heathrow's business car park. The PRTs are British-made, by Bristol-based firm Advanced Transport Systems and are being championed for their energy efficiency. Being battery powered they are said to be 50 per cent efficient than buses. The PRTs are being showcased at the Science Museum as part of an exhibit titled 'The Making of the Modern World'. As it says on the Science Museum website: "What could public transport look like in the future? One idea being tested at Heathrow is a network of personal driverless pods. Gliding along tracks, these 'pod cars' will take passengers non-stop to their destinations, cutting down on congestion and pollution. If they're a success, we could see pod cars in cities all around the world." If you want to learn a little bit more about the pods, then engineers working on the PRTs will be on-hand at the museum 11-13 August to answer questions.